The PeopleClues Employee Engagement assessment measures the engagement between an individual and his or her job and also to their employer. 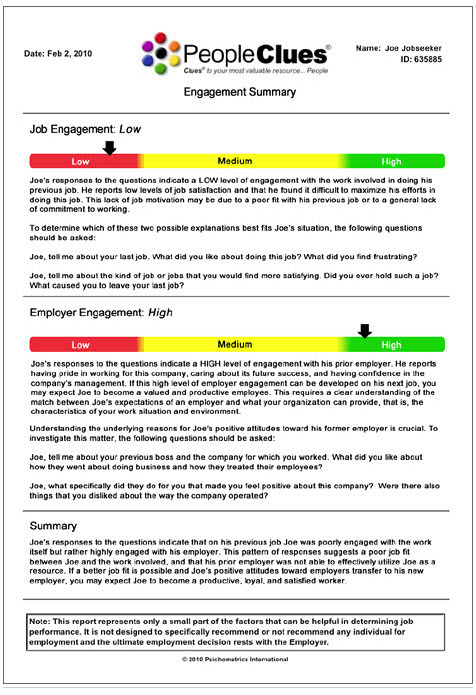 The assessment uses a graph with Low, Medium or High to show the level of engagement to job and also to the employer. Dynamically generated interview questions are also included along with a summary statement. To test drive our new employee engagement assessment, complete our contact form and type “Employee Engagement” in the comment box.